Set it back to Classic in the edit options. All looks back to normal. Crisis diverted. thanks for selecting my 'mean' car. THANKS for selection my car. While I like the graphics and lettering, I do not like the way the forum pages look. I used to love coming to the site and it was easy to see what was "new" or had been "updated" at the bottom of the page, now it's very are to look quickly and see what topics have been updated/started recently. Last edited by The_Ghost; 03-24-2016 at 07:42 AM. Not sure if it's a better function or worse. But it does load faster. That's a plus. One of the things I didn't like about the site before was that it would load so slowly. This is an improvement. I do wish there was an easy to find key for the symbols used on the forums. What's the symbol for threads I've replied to? I think I can spot the unread threads. Thanks and glad she made it. Do not want that job, lol. Yeah if you guys are having issues or do not like the new look you can revert to classic view. Read first post. 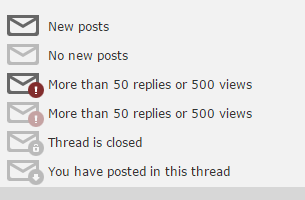 You can use the tools on the main toolbar to sort new posts. Stay logged in and all those ads and the bottom should not show. THANKS for selection my car. I wish I could see it on my display!!! Last edited by L-N-F'n; 03-24-2016 at 09:54 AM. We can tweak colors if needed. THANKS for selection my car. I wish see it on my display!!! Sorry, here is a screenshot so you can see her. It's not a big enough deal to worry about changing it, I'll get used to it and then it'll look fine. For the most part, everything works pretty much as it used to for me, so it's OK, as long as the content is the same and it's easy to get to, I'm OK. Overall, this conversion went a lot better than the one for our Sky brothers and sisters, so keep up the good work. You call that yellow? Yellow is the color of the Solstice on the far right that some of our resolution-challenged members don't see. To me it looks more like Baby Pxxx Brown. The colors used here are a bit different, kind of unusual, at least to me, but I'm color blind to several colors, and I'll get used to it. It looks like you can tweak some of the colors in the User CP (control panel) area. That's pretty nifty- haven't seen that before in forum software. The pages load blazing fast for me. Someone did some serious work to make that happen. Awesome. LOL - let me see what they can do.